In the past, I have been called an oddball. It used to make me very self-conscious but as the years went by, I realized that the people calling me that were so boring that it made me glad I wasn’t like them. Better to be an interesting oddball than a stick in the mud plain old human. Being an off center guy, I found that all the things in life that I enjoy tend to be a bit out of the ordinary. This brings me to the wine that I discovered for myself. It’s called Sasyr. Rocca delle Macie is a pretty cool Italian winery that has produced some really great wines over the years. The winery is actually one year younger than I am. You’ll have to look that up yourself! It was established the Chianti Classico zone by Italo Zingarelli who produced some wildly popular Italian films. The winery and its traditions were passed down to Italo’s kids. His son Sergio took the helm and made RdM a worldwide wine brand. Among their non-traditional wine collection is what I took home with me last night; Sasyr. 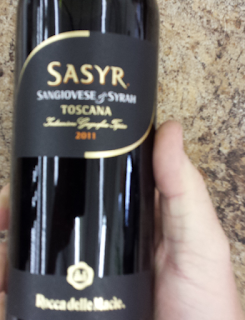 Sasyr is a blend of Sangiovese and Syrah. Yeah. That sounds kind of weird, right? It’s not. These guys had the innovative thought to blend one of Italy’s favorites with one of France’s favorites. The result is Euro-riffic. On first taste, it was a waterfall of cherry flavor typical of a nice Chianti. The second mouthful showed the other side of the wine, the 40% helping of Syrah. This opened the wine up to flavors of other dark berries, white pepper, and the faintest hint of clove. I would imagine the clove is undetectable, but the smell of cloves is one of my favorite things and I happened to pick up on it. Overall, the wine was fruity and juicy. It had medium tannins which means it didn’t make my face pucker. Smooth and fruity, relaxed and easy to drink, this wine is a no-brainer. If you’re looking for an oddball in the wine department, I’ll be there and so will Rocca delle Macie’s Sasyr. Enjoy it!